Combine innovative styling with powerful performance and what do you get? The Canon MP21DX printing calculator features quick and quiet two-color, crisp, professional printouts. Positive numbers are printed in black while negative numbers appear in red for fast and easy identification. The contoured design of each keytop has been developed to fit your fingertips, ensuring impressive speed and comfort. 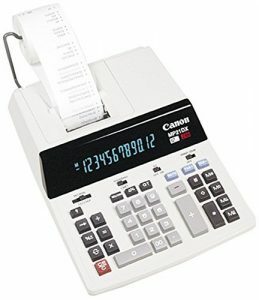 The Canon MP21DX printing calculator provides a large 12-digit display and a high-speed ink-ribbon printer. It has a four-key memory, and plugs into any standard outlet, never requiring batteries. Convenient features like the profit-margin function and tax-rate memory make work faster while ensuring consistent and accurate numbers. This Canon MP21DX calculator offers an easy-to-read fluorescent display. The large, fixed-angle screen shows up to 12 digits, providing accurate numbers for accounting. This powerful and easy to use Canon MP21DX printing calculator features a high-speed printer that produces 3.5 lines per second, making fast printouts for documentation purposes. The dual-color ribbon prints negative numbers in red and positive numbers in black, eliminating errors caused by misreads. The Canon MP21DX calculator comes with a profit-margin feature which calculates selling price or discount based on desired profit margins. The tax-rate feature allows users to save rates that they frequently work with, saving time and ensuring that results are accurate and consistent. I use printing calculators every day. I prefer big clunky buttons and this definately has them. It is solid and dependable. Very nice calculator. I bought this Canon mp21dx printing calculator to replace a Canon model that I had that was probably 35 or 40 years old. I am really glad I did. I was using a fairly large calculator and didn't want to resort to a very small one. This one fits the bill. The keys are spaced comfortably apart. The display is nice and bright and large enough to see. Probably the only negative aspect is the bar that holds the paper roll. The model I had previously had two arms that held the paper in place. This one has a single bar for the paper roll to hang and when the paper gets slack it hangs loosely and is messy rather than staying snug. I guess that isn't a big issue, just a little annoying. I wouldn't let it keep me from making the purchase. It's the greatest! I ordered the calculator as a replacement for a Sharp that I had had for a couple of years. The Sharp had a real problem with the paper getting jammed inside the workings of the calculator. If this occurred, you would have to get another entire unit because it would ruin the calculator trying to unjam the paper. Needless to say, I was paranoid. This calculator is the best. The whole "feel" of it puts the old to shame. It is much sturdier than any I used previously and I love it! This calculator was actually cheaper than the Sharp, making it a better buy all the way around. I like what I refer to as the old time "adding machine". The first one I bought at a local store, powerful and easy to use calculators. Superb, but ink cartridge faulty. Out of the box and ready to go. It's quiet and easy to use. It feels like something that won't break easily. I have only had it for 2 months, but so far so good. Only thing that wasn't perfect, is that the ink is faded, and needed a new ink cartridge on the first use, which of course, I didn't have! This is a great machine. I ordered the same model that lasted me 11 years at my full time job (accounting) and I don't know how long it was here before me. I expect this one to last just as long but I'll be retired by then! Would encourage anyone to purchase a Canon. Fine for our purposes. This is the standard calculator used by our accounting department. I haven't heard any negative feedback so far! Better than my last one which was same but older model. My last one was used a lot and last a long time before paper feed stopped working correctly hopefully I get the same life out of this one.